Military organization or military organisation is the structuring of the armed forces of a state so as to offer such military capability as a national defense policy may require. In some countries paramilitary forces are included in a nation's armed forces, though not considered military[by whom?]. Armed forces that are not a part of military or paramilitary organizations, such as insurgent forces, often mimic military organizations, or use ad hoc structures, while formal military organization tends to use hierarchical forms. The use of formalized ranks in a hierarchical structure came into widespread use with the Roman Army. In modern times, executive control, management and administration of military organization is typically undertaken by governments through a government department within the structure of public administration, often known as a Ministry of Defense, Department of Defense, or Department of War. These in turn manage Armed Services that themselves command formations and units specialising in combat, combat support and combat-service support. The usually civilian or partly civilian executive control over the national military organization is exercised in democracies by an elected political leader as a member of the government's Cabinet, usually known as a Minister of Defense. (In presidential systems, such as the United States, the president is the commander-in-chief, and the cabinet-level defense minister is second in command.) Subordinated to that position are often Secretaries for specific major operational divisions of the armed forces as a whole, such as those that provide general support services to the Armed Services, including their dependants. Then there are the heads of specific departmental agencies responsible for the provision and management of specific skill- and knowledge-based service such as Strategy advice, Capability Development assessment, or Defense Science provision of research, and design and development of technologies. Within each departmental agency will be found administrative branches responsible for further agency business specialization work. In most countries the armed forces are divided into three or four Armed services (also: service, military service, or military branch): army, navy, and air force. In larger armed forces the culture between the different Armed Services of the armed forces can be quite different. Most smaller countries have a single organization that encompasses all armed forces employed by the country in question. Third-world armies tend to consist primarily of infantry, while first-world armies tend to have larger units manning expensive equipment and only a fraction of personnel in infantry units. It is worthwhile to make mention of the term joint. In western militaries, a joint force is defined as a unit or formation comprising representation of combat power from two or more branches of the military. Gendarmeries, including equivalents such as Internal Troops, Paramilitary Forces and similar, are an internal security service common in most of the world, but uncommon in Anglo-Saxon countries where civil police are employed to enforce the law, and there are tight restrictions on how the armed forces may be used to assist. "Military formation" redirects here. For the arrangement or deployment of moving military forces, see Tactical formation. It is common, at least in the European and North American militaries, to refer to the building blocks of a military as commands, formations and units. In a military context, a command is a collection of units and formations under the control of a single officer. Although during the Second World War a Command was also a name given to a battle group in the US Army, in general it is an administrative and executive strategic headquarters which is responsible to the national government or the national military headquarters. It is not uncommon for a nation's services to each consist of their own command (such as Land Component, Air Component, Naval Component, and Medical Component in the Belgian Army), but this does not preclude the existence of commands which are not service-based. A formation is defined by the US Department of Defense as "two or more aircraft, ships, or units proceeding together under a commander". Formin in the Great Soviet Encyclopedia emphasised its combined-arms nature: "Formations are those military organisations which are formed from different speciality Arms and Services troop units to create a balanced, combined combat force. The formations only differ in their ability to achieve different scales of application of force to achieve different strategic, operational and tactical goals and mission objectives." It is a composite military organization that includes a mixture of integrated and operationally attached sub-units, and is usually combat-capable. Example of formations include: divisions, brigades, battalions, wings, etc. Formation may also refer to tactical formation, the physical arrangement or disposition of troops and weapons. Examples of formation in such usage include: pakfront, panzerkeil, testudo formation, etc. A typical unit is a homogeneous military organization (either combat, combat-support or non-combat in capability) that includes service personnel predominantly from a single arm of service, or a branch of service, and its administrative and command functions are self-contained. Any unit subordinate to another unit is considered its sub-unit or minor unit. It is not uncommon for unit and formation to be used synonymously in the United States. In Commonwealth practice, formation is not used for smaller organizations like battalions which are instead called "units", and their constituent platoons or companies are referred to as sub-units. In the Commonwealth, formations are divisions, brigades, etc. Different armed forces, and even different branches of service of the armed forces, may use the same name to denote different types of organizations. An example is the "squadron". In most navies a squadron is a formation of several ships; in most air forces it is a unit; in the U.S. Army it is a battalion-sized cavalry unit; and in Commonwealth armies a squadron is a company-sized sub-unit. A table of organization and equipment (TOE or TO&E) is a document published by the U.S. Army Force Management Support Agency that prescribes the organization, manning, and equipage of units from divisional size and down, but also including the headquarters of Corps and Armies. It also provides information on the mission and capabilities of a unit as well as the unit's current status. A general TOE is applicable to a type of unit (for instance, infantry) rather than a specific unit (the 3rd Infantry Division). In this way, all units of the same branch (such as infantry) follow the same structural guidelines. The following table gives an overview of some of the terms used to describe army hierarchy in armed forces across the world. Whilst it is recognized that there are differences between armies of different nations, many are modeled on the British or American models, or both. However, many military units and formations go back in history for a long time, and were devised by various military thinkers throughout European history. For example, the modern Corps was first introduced in France about 1805 by Napoleon as a more flexible tactical grouping of two or more divisions during the Napoleonic Wars. They have become part of the organization of most armies around the world. Rungs may be skipped in this ladder: for example, typically NATO forces skip from battalion to brigade. Likewise, only large military powers may have organizations at the top levels and different armies and countries may also use traditional names, creating considerable confusion: for example, a British or Canadian armored regiment (battalion) is divided into squadrons (companies) and troops (platoons), whereas an American cavalry squadron (battalion) is divided into troops (companies) and platoons. Army, army group, region, and theatre are all large formations that vary significantly between armed forces in size and hierarchy position. While divisions were the traditional level at which support elements (field artillery, hospital, logistics and maintenance, etc.) were added to the unit structure, since World War II, many brigades now have such support units, and since the 1980s, regiments also have been receiving support elements. A regiment with such support elements is called a regimental combat team in US military parlance, or a battle group in the UK and other forces. During World War II the Red Army used the same basic organizational structure. However, in the beginning many units were greatly underpowered and their size was actually one level below on the ladder that is usually used elsewhere; for example, a division in the early-WWII Red Army would have been about the size of most nations' regiments or brigades. At the top of the ladder, what other nations would call an army group, the Red Army called a front. By contrast, during the same period the German Wehrmacht Army Groups, particularly on the Eastern Front, such as Army Group Centre significantly exceeded the above numbers, and were more cognate with the Soviet Strategic Directions. 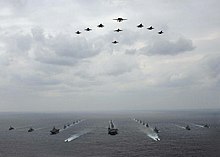 Naval organization at the flotilla level and higher is less commonly abided by, as ships operate in smaller or larger groups in various situations that may change at a moment's notice. However, there is some common terminology used throughout navies to communicate the general concept of how many vessels might be in a unit. Navies are generally organized into groups for a specific purpose, usually strategic, and these organizational groupings appear and disappear frequently based on the conditions and demands placed upon a navy. This contrasts with army organization where units remain static, with the same men and equipment, over long periods of time. The five-star ranks of Admiral of the Fleet and Fleet Admiral have largely been out of regular use since the 1990s, with the exception of ceremonial or honorary appointments. Currently, all major navies are commanded by an admiral (four-star rank) or vice-admiral (three-star rank) depending on relative size. Smaller naval forces, such as the RNZN, or those navies that are effectively coastguards, are commanded by a rear-admiral (two-star rank), commodore (one-star rank) or even a captain. Aircraft carriers are typically commanded by a captain. Submarines and destroyers are typically commanded by a captain or commander. Some destroyers, particularly smaller destroyers such as frigates (formerly known as destroyer escorts) are usually commanded by officers with the rank of commander. Corvettes, the smallest class of warship, are commanded by officers with the rank of commander or lieutenant-commander. Auxiliary ships, including gunboats, minesweepers, patrol boats, military riverine craft, tenders and torpedo boats are usually commanded by lieutenants, sub-lieutenants or warrant officers. Usually, the smaller the vessel, the lower the rank of the ship's commander. For example, patrol boats are often commanded by ensigns, while frigates are rarely commanded by an officer below the rank of commander. Historical navies were far more rigid in structure. Ships were collected in divisions, which in turn were collected in numbered squadrons, which comprised a numbered fleet. Permission for a vessel to leave one unit and join another would have to be approved on paper. The modern U.S. Navy is primarily based on a number of standard groupings of vessels, including the carrier strike group and the Expeditionary Strike Group. Additionally, Naval organization continues aboard a single ship. The complement forms three or four departments (such as tactical and engineering), each of which has a number of divisions, followed by work centers. The organizational structures of air forces vary between nations: some air forces (such as the United States Air Force and the Royal Air Force) are divided into commands, groups and squadrons; others (such as the Soviet Air Force) have an Army-style organizational structure. The modern Royal Canadian Air Force uses Air Division as the formation between wings and the entire air command. Like the RAF, Canadian wings consist of squadrons. A task force is a unit or formation created as a temporary grouping for a specific operational purpose. Aside from administrative hierarchical forms of organization that have evolved since the early 17th century in Europe, fighting forces have been grouped for specific operational purposes into mission-related organizations such as the German Kampfgruppe or the U.S. Combat Team (Army) and Task Force (Navy) during the Second World War, or the Soviet Operational manoeuvre group during the Cold War. In the British and Commonwealth armies the battlegroup became the usual grouping of companies during the Second World War and the Cold War. Within NATO, a Joint Task Force (JTF) would be such a temporary grouping that includes elements from more than one armed service, a Combined Task Force (CTF) would be such a temporary grouping that includes elements from more than one nation, and a Combined Joint Task Force (CJTF) would be such a temporary grouping that includes elements of more than one armed service and more than one nation. ^ In the United States it is a common misunderstanding that their armed forces are totally prohibited from doing so by the Posse Comitatus Act. This Act, which reserves to Congress the power to employ Federal military force to enforce law and order, refers specifically only to the US Army and US Air Force. The US Marines and Navy are separately regulated, and the Coast Guard has a clear law enforcement role in its peacetime status. The state-controlled Army National Guard (technically a branch of the US Army) is also excluded from the Posse Comitatus Act. The Insurrection Act specifically permits the President to use Federal military force to restore public order in extreme emergency situations: this Act was implemented during the "Rodney King Riots" in Los Angeles. ^ "Доклад НКО август 1939. doklad-nko-8-39.shtml". Armor.kiev.ua. Retrieved 2013-11-20. ^ Центральный государственный архив Советской армии (с июня 1992 г. Российский государственный военный архив). В двух томах. Том 2. Путеводитель. 1993 (in Russian). Guides.rusarchives.ru. Retrieved 2013-11-20. ^ Group. GlobalSecurity.org. Retrieved 2009-08-30. ^ US Navy. GlobalSecurity.org. Retrieved 2009-08-30.